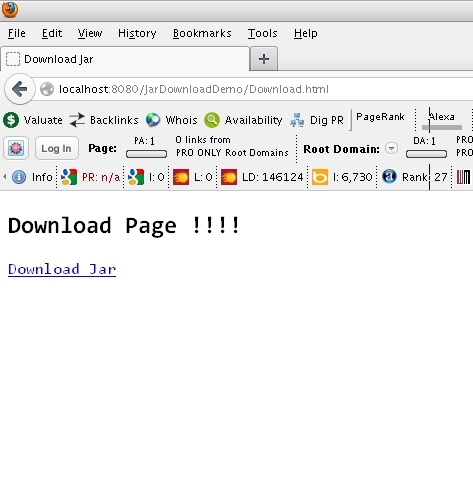 How to write a Servlet code to download a Jar or file from the Server at a specified location ?. A simple application demonstrating how to write a Servlet code to download a Jar or file from the Server at a specified location. 1. A simple html file for sending a get request to server for the Jar/file. 2. Servlet code for downloading a Jar/file to a specified location on client's machine. // a jar file not an html content. // we set the content type as "application/jar"
// which returns the resource located at the named path as an InputStream object. // The data in the InputStream can be of any type or length. // This method returns null if no resource exists at the specified path. // and writing it to the browser through outputstream created above.